The Bureau of Meteorology increased the size of a severe weather warning zone affecting four states as a brutal cold front headed in from the west. WILD weather is careering its way through the country's southeast, uprooting trees and swelling rivers, as winds well in excess of what was forecast just hours ago pound into capital cities. On Tuesday morning, the Bureau of Meteorology (BoM) increased the size of a severe weather warning zone affecting four states as a brutal cold front headed in from the west. Gusts of 145km/h have been recorded close to Hobart, far in excess of the 110km/h forecast. Winds of almost 90km/h have rocketed through Melbourne's suburbs. And the worst could be yet to come with the BoM advising Tasmanians to "batten down the hatches". 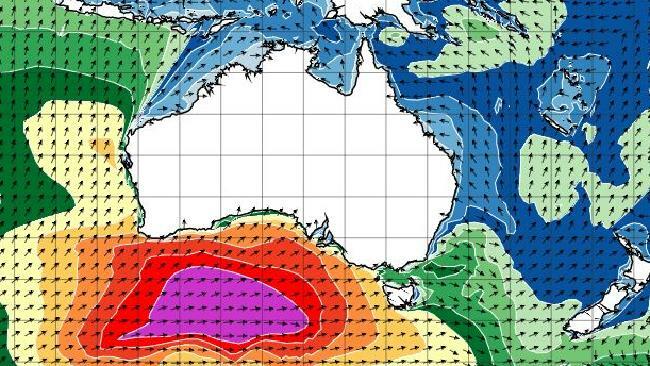 A map released by the weather bureau on Tuesday (below) graphically shows swells of 8 metres touching the shore line of southwest Western Australia and more than 10 metres out to sea. The swell is now heading east across the Great Australian Bight towards the southern states. An graphical representation of large wave swells. 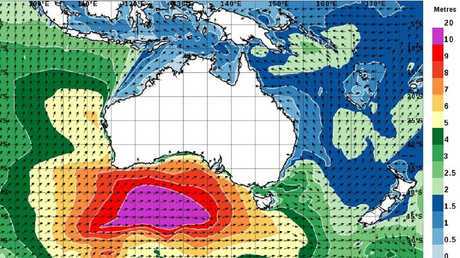 The purple patch is wave heights in excess of 10 metres — and they're heading towards the eastern states. Dangerous winds are now pummelling, or soon will, much of Tasmania and Victoria as well as parts of South Australia. The zone of NSW thought to be at risk has been increased to the entirety of the Great Dividing Range from the Victorian border to the Blue Mountains. 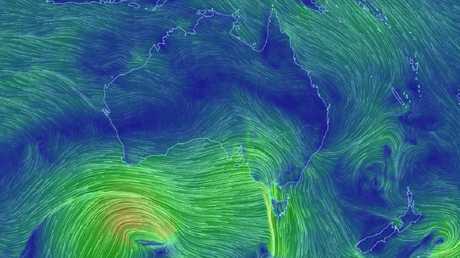 "Across southern Australia we're about to see some really windy conditions," said Sky News Weather meteorologist Rob Sharpe on Tuesday. In SA, 6000 homes were without power on Tuesday lunchtime after the front hit. The ABC has reported trees have come down in Mt Gambier. A gust of 117km/h was recorded at Mt Crawford at 11.30am. Satellite pictures clearly show the huge band of cloud associated with the cold front advancing across Victoria and into Melbourne on Tuesday lunchtime. The full brunt of the front is expected to hit the city by 4pm. The "feels like" temperature has sunk in the outer suburbs to just 3.2C. As it crosses the state, the drastic weather change could bring heavy showers and thunderstorms. Damaging winds averaging 50 to 60km/h with peak gusts of 90 to 100km/h, up to 120km/h on higher ground, are likely according to Victoria's weather warning. A gust of 89km/h was record at Moorabbin Airport late on Tuesday morning with a peak of almost 70km/h in the CBD. A gust of 102km/h was record at Horsham at 1pm. 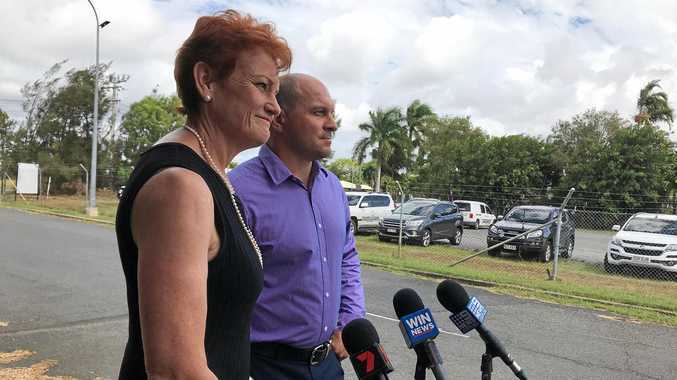 "Were going to see winds ramping up across Victoria from the west through today and showers will start in west in the back end of morning but by afternoon and evening they will be spreading across the reminder of the state," Mr Sharpe said. "In Tasmania, there will be winds of 90-100km/h across much of the state with showers and areas of rain." However, even fiercer gusts have been recorded on the Apple Isle with 145km/h on Mt Wellington, near Hobart, and 98km/h in the city centre. Flood warnings are now in place for the Meander river with flood watches on a score of other Tasmanian waterways. The SES has advised people to secure loose outdoor items such as furniture and trampolines, and move vehicles undercover and away from trees. The winds are likely to ease into Tuesday evening and early Wednesday morning. But, don't relax for too long, another cold front is approaching later in the week. Wild winds crossing The Bight towards the country's south east at 1pm Tuesday. Mostly sunny for much of the week with highs of around 22C and morning lows of 8-9C. Some rain from Friday and cooler days reaching 16-19C. Highs of around 15-16C this week, cooling slightly into the weekend. Lows of around 7-10C overnight. On Tuesday, a high chance of showers, thunderstorms and possible hail in the afternoon and evening. Possible rain for Thursday and Friday as well. The nights will continue to be cold, sinking to 6-7C, until Thursday. But the days will be warm and sunny, around 24C. Towards the weekend cloud cover should make the nights warmer but the days will cool slightly to around 22C. Sunny with showers. Chilly nights of around 6C and daytime highs in the late teens for the week. Showers are likely for much of the week, at this point a sunny Wednesday being the exception. Expect windy condition earlier in the week as a cold front passes through. Highs of 15-17C with lows of around 9-10C. Friday is likely to see the coldest start to the day at just 7C. A wet week in the Tasmanian capital with as much as 10mm of rain on Thursday. A high of 16C on Tuesday dropping to just 11C on a cold Friday. Pre-dawn lows of 5C on Wednesday and just 4C on Friday and Saturday. The capital will get a break from some of the bone achingly cold mornings of late. But, being Canberra in winter, it will still be chilly. Lows of -1C early in the week and -3C on Saturday but warmer in between. Highs of between 13-15C during a mostly sunny week. The Top End will see sunny days and highs of 33C and night time lows around 20-22C.